…what’s that Imperial marching band sound I hear in the distance? …oh, no! Please don’t tell me it’s the ruddy Austrians again, with that jumped up leader, Radetzky, taking over the city? This is a pretty brand-spanking new cooperative title I bought from this year’s Essen Game Fair based mostly on how it looked but also partly on having watched a number players play a demo game at the Post Scriptum/Demoela exhibitor’s stand… which left me wondering to myself how this might be as a solo experience. A huge gamble, I know, using my own money for a game I hadn’t researched extensively before hand, which is my norm… but as I did get it offered at a slight discount, and only because I got a good feeling about the game, I went and parted with a small wad of Euros. Most uncharacteristic of me so I was expecting big things…but would this game deliver? Would this language free (except rule book) area control, card driven action game live up to my expectations, or would I sourly regret parting with my cash (not to mention the enormity of the task simply getting my wallet to open)? So dear soloist, let us see how events are to unfold in Milano during the 1848 Austrian occupancy!… was it really worth me parting with hard cash? I so often find this the hardest element of any review to convey to other gamers, particularly as much of the influencing factors result in a very subjective opinion. In this instance the game components are pleasantly illustrated with imagery that does lend to a slight historical feel and the topic is certainly an interesting once to explore in game form. However, looks don’t make for deeply immersive feel alone, and I am not sure the mechanics… the way the game plays thrust us at the forefront of this turbulent period from a true realism point of view. In contradiction to my self, I do, however, feel this is an immersive game. How so? you cry in unison… which is apt for a solo audience. Let me expand on this… the immersive nature, not the solo calling out in unison. We do have a strong theme… the point to our game-play. We also have mechanics that emulate conflict, movement and area control which don’t necessarily make us feel we are deeply ensconced in Milan as, perhaps a miniature skirmish or hex-and-chit war-game might, but they do manage to all pull together, giving us a game-play/experience that is ‘all engaging’, ‘all consuming’ and on this basis, I proclaim that it does immerse us in a slightly abstracted, but deeply rewarding game. There is a distinct focus on area control here, working with a rudimentary hand-management of multiple use Action cards that drive the bulk of the game. It is the whole feel of the game that make this an interesting little chap. The individual mechanics, details of which I shall not bore you with, combine to make for a rather compelling game. The method of combat/conflict of territory makes an interesting adaption of the rock/paper/scissors process, but it is the multiple use cards that are most noticeable, and of most interest in a game. Ha… I neglected to mention that cards can be discarded, for want of a better phrase, over a number of turns, in an attempt to upgrade the special abilities they have. The discarded cards regrettably have no further use other than facilitating an upgrade, but subsequent cards played get to benefit/reap the rewards. The above example shows that the discarded set of ‘rock’ cards has upgraded the combat action. now, when combat takes place, we can draw three rather than two Austrian cards from which to choose one to oppose. This is one of the numerous understated ways we can plot, plan and negate any of the ‘dreaded’ luck elements within the game. Despite all this waffling on about cards, we, the Italian freedom fighters, have an uphill task occupying regions of the city as the movement of Radetzky around Milan does not automatically reveal location cards for us to occupy. Instead, a rather cunning tracker has been included (adjustable for player count) to monitor the number of opposition troops that have been eliminated from the game. As this tracker reaches its end, previously revealed location cards become available for us to occupy, and the tracker resets to its start position. I found this a rather nice touch as we are forced to confront the enemy in order to advance our territory control…which in turn means we have to push our luck during each conflict. We must plan and position our forces to optimum effect or see Milan flood with the weight of Austrian forces. The board and standee are well finished sturdy affairs and with the numerous wooden tokens, culminate in an aesthetic pleasure to behold. the illustrations and graphic layout are such that a cohesion is maintained through out the components whilst offering ease of icon understanding/identification. 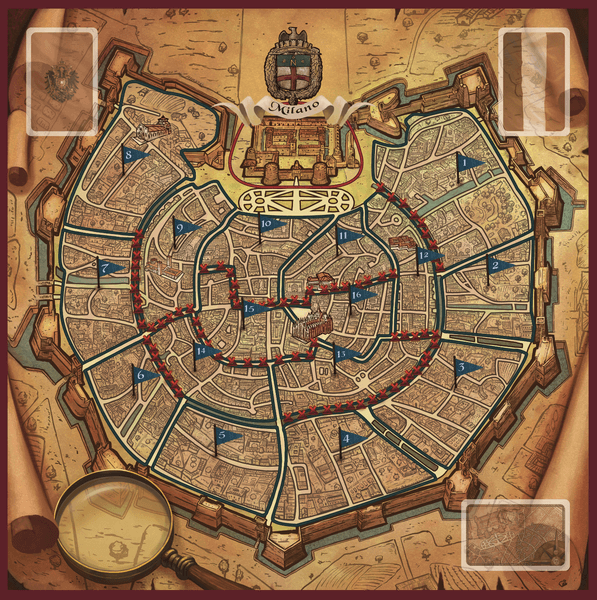 A rather nice touch is the full board illustration applied to the reverse of the game-board. of no consequence to game-play but something to boost the quality feel of the game. The whole presentation is of a highly professional nature. This is first and foremost a cooperative game where multiple players take on the game its self (The occupying forces of Austria). Being cooperative, obviously opens this up for a soloists such as ourselves to take on the oppressors single handed. The designers have actually put a little more thought into the game for solo play than merely letting us loose with the cooperative game. We operate three Italian pawns and draw a hand of cards for each pawn activated… and in this way we have three turns to perform actions based upon the hand of cards we hold. Planning works just as it would for multiplayer only those tricky discussions are held within our own mind (our out loud when Me, Myself and I get into heated discussions). Turn order is obviously taken out as we are the sole operator, but it can, in some circumstances allow us better manipulation of circumstances as we choose which pawn to operate and when. Support is a particularly useful feature during solo play. If two pawns find themselves at the same location, a set of three additional cards may be drawn to assist (these can only be used for combat, not for their actions) which helps us take on the leader, Radetzky, himself. There are no complex dashboards or multiple statistics to monitor as a solo player taking on multiple roles might be expected to do, which means we can focus more on strategy, logistics, pawn movement and tactical elimination of enemy units, along with planning the best use of our card’s abilities. This all makes for a particularly entertaining and challenging puzzle-like solo experience. Winners and Losers: This is such a tough cookie to try and much on. When I bought this game, they told me it was a difficult one to beat, and they weren’t kidding. It is not a particularly difficult task because of its complexity, rather more it is down to the might of the oppressive Austrians, making life most awkward for us. I think this is an intentional feature to replicate the particularly difficult historical events that were witnessed unfolding during the period. As game-play is quite straight forward, a crushing defeat merely shows us where huge, ungainly holes have appeared in our previous strategies, and are lessons to be learned and improved upon in subsequent plays. Rules is Rules is Rules: There is a forty page rule-book but don’t be put off. Firstly the book is A5 size and has many illustrations to aid explanation of various mechanics. There is also a couple of pages detailing historical information about the protagonists from both sides and a half page detailing the slight changes to allow solo play. By and large the rule-book is simple to understand and the mechanic concepts are relayed to us with minimal fuss. There was just one detail I felt needed slightly more clarification regarding elements of the Austrian AI unit placement (involving pare units going to the castle in readiness to spill out en mas into the city. I emailed the designers and this was clarified. Game-play… or, rather round by round activity is pleasingly simple. There are more conditions that need to be heeded when deploying and moving Austrian forces. Not an enormous task in its self but several important rules govern what happens during the AI stage. Lucky Buggers: I would say that the combat system is the only real source of luck based interaction in this game. Combat using the rock/paper/scissors method against a blind draw from the AI could be particularly frustrating to those that like to have some control over outcomes. Fret not, you tiny control freaks, you, for the game is not entirely left to chance. During play we do have opportunity to draw additional cards which making for a greater selection of resources to draw from …if we do choose to combat the opponents. Within the combat system, we may stop at any time and reap any benefits attained thus far… or we can, based on the cards we have left, push our luck and continue clearing areas of troops. Obviously if we push our luck and fail at any particular point all previously illuminated troops this combat turn get returned to thew board. Highs and Lows: This is based on a particularly turbulent and violent point in history but the way the game is illustrated and the abstracted nature of the game-play, remove us from all but a hint at what transpired. As such, we focus on the puzzle and (particularly from my point of view) despite many losses, feel compelled to return and sort out Radetzky once and for all! Footprints All Over Both Sides of My Table: Radetzky is remarkably self contained bar the cards we hold in our hand, every other aspect of the game can be accommodated on the board/tracker. Realistically a solo game can be comfortably played within a 50cm x 50cm playing space, which makes a very handy large game fill but a small space (I shall be taking this with me on holidays as it is light and needs only a limited area to set up. Build It Up Just To Tear It All Down Again: There is a simple procedure to populate the board with the AI Austrian forces and three decks of cards to shuffle. beyond this there is little more to setup which should not see anyone spending more than ten minutes or so getting things ready for action. similarly, with a relatively low component count (namely cards and cubes) packing away is mere moments of a players time. and I regularly feel compelled to get it out and try once more to best this Austrian fella. It can be perplexing, there can be a tendency to rush and all the while the forces of the AI grow ever stronger. This really is a difficult challenge of a puzzle to solve, but equally entertaining and engaging. I found play to be quick and easy to oversee, but all the while these simple mechanics lend themselves to a bugger of a foe to beat. Surprisingly, I have found this title rather addictive and, admittedly, I have yet to vanquish the Austrians (although I did come very close a couple of times) I feel compelled to take to arms again and again. This brutal Field Marshal Joseph Radetzky chap is hell-bent on denying Italian access to the BSoMT 1d8 die, but the perseverance of the Italian uprising find a way to occupy enough space in Milano to achieve a rebellious (7). This is not a complex strategy game, but tests us to the extreme when trying to fend off an aggressor. This is definitely a great title worthy of the attention of soloists that wish a lighter game-play that still packs a punch in the puzzle solving department.